What If This Was Your Own Backyard? ...It could be... All you need is a beehive or two! What would you think if I told you that you can build your own beehive for less than a dinner for two at your favorite restaurant? And what would you think if the beehive that you'll build is sustainable, bee-friendly, and so easy to use that you can build one in a single afternoon? The Warre Garden Hive Construction Guide 2.0 Requires Only Moderate Skills and Uses Low-Cost Materials. Why build your own beehive? There are plenty of beehives for sale on the Internet and from beekeeping supply shops. If you don't mind paying out over $200 or more for just one beehive. There are a lot of beehive building instructions available for free... if you can figure out how to use them. Sometimes, you don't know exactly what tools you'll need, or even what materials are the best to use! Maybe you asked around for help on forums. Maybe you paid for help. Or maybe you spent several hours or days hunting around the search engines trying to find a good beehive that was easy to use and simple to build... and fun for you and your family... only to find that you were looking for something as hard to find as a needle in a haystack. Because all that searching, analyzing and comparing can get frustrating, and you can run into dead-ends, I understand that you want a simple shortcut to building your own beehive. You want to be able to easily assemble your hive, finish it and install it, and have it ready for your own colony of honeybees. Anyone capable of wielding a saw and a hammer will find this guide invaluable - particularly the very clear photographs - and you make it all very easy to follow with step-by step instructions. I see you have also included diagrams that expert woodworkers can use - and some great bonuses! I recommend this publication to anyone thinking of building a vertical top bar hive - nothing else I have seen comes close. 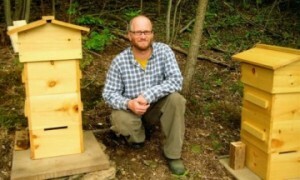 Phil Chandler (www.biobees.com) | Author of "The Barefoot Beekeeper"
I have to share a secret with you...building your own beehive is enjoyable! Handcrafting a beehive for your own colony of honeybees is an experience you will never forget. When your first colony of honeybees accepts the beehive you made for them, it is a very rewarding experience! It is made even more rewarding when you see just how easy and inexpensive it was to build! 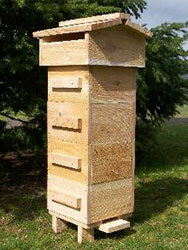 Choose a location and install your finished beehive ready for your own honeybees! With the simple directions I give you in your Warre Garden Hive Construction Guide 2.0 manual, you will be able to build easy-to-use beehives for use in a low impact and chemical free environment... Guaranteed! The types of materials I use to build beehives. These materials are easy to find and also very inexpensive. You can build a complete beehive for less than a night on the town! Step by step "Point of View" pictures - look over my shoulder as I build, finish and install a complete beehive... Never worry about getting lost in the instructions again! You'll know exactly what to do and when to do it! Thanks for the Garden Hive Construction Guide 2.0. Very well done. I think that even I can follow these directions. Great detail with pictures. You did not miss a trick. Truly a wonderful piece of work. Thank you again. God Bless. This is an all in one package. Do you want to build a top bar hive? Just follow the plans included in this manual. Do you want a frame beehive? Just follow the plans included in this manual. You get to choose how you want to build your own beehive. Additionally, those of you who are ordering through this page will get a special bonus — full parts checklists for the Warre Garden Beehive in both Imperial fractional and Metric measurements. 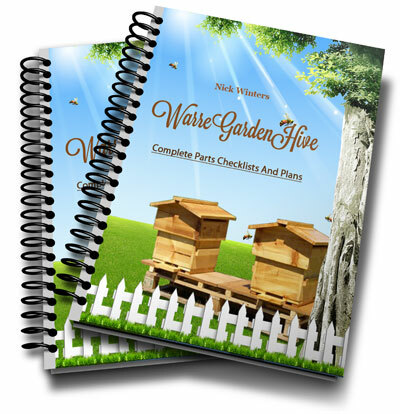 These checklists contain a list of every single piece of wood you will need to build your garden hive. Not only that, but these sheets give you the measurements for both 3/4" wide and 1" wide wood... these are the most popular wood sizes for beehives today! All you have to do is flip to the hive part you want to build. Make a note of the wood dimensions and then just measure, cut your piece of wood and you are done! No fiddling with fractional calculations or other difficult measurement transfers. Just find your part, and then cut your piece of wood! Great package. Very easy to understand. I'm looking forward to building my first hive. Great "extras" too. 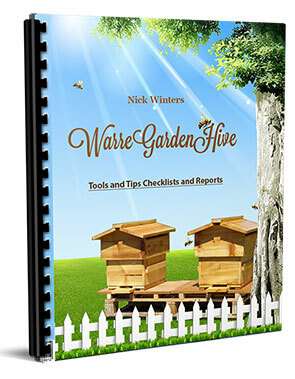 Not only do you get the parts checklists and diagrams I've mentioned above, you also get 9 step-by-step videos for the Warre Garden Hive Construction Guide 2.0. I actually go through every page and every step in both the manual and all the checklists and documents so you don't miss anything. On the off chance something didn't make sense in the book, everything will be perfectly clear in the video. It also saves you a TON of time. If you're a beehive building newbie, it might take you an hour or two to get started with the construction process. But if you watch a video, you can get the hang of the whole process in about 25 minutes. It's like watching over my shoulder as I show you what to do and when to do it! Why spend the next weeks and months trying to figure out all of the steps it takes to get your beehive created and set up -- when you can watch someone show you exactly how to take action and get it up and running today? And with every one of these 9 videos, you'll be able to watch them directly on the computer screen itself! I found the plans and all the extras very useful indeed. Nothing too complicated for the unskilled, and easy to follow. Building a Warré hive is on my list of things to do ready for next Spring. Checklists and Reports Bonus Value: $39.80 Yours Free! Your garden hive construction guide is beautifully done. very clear and easy to follow. Some one with little or no wood working skills (such as myself) could easily build the warre garden hive using this guide. The photography is wonderful and really clears up many questions left from looking at all the computer or hand drawn plans online. Thank you for all your hard work putting this great resource together. In addition to these great bonuses, you will also get full access to the Spring 2009 Natural Beekeeping Webinar recorded live with a great group of beginning and advanced beekeepers. We talked about beekeeping from a sustainable perspective and answered a lot of excellent questions on beginning backyard beekeeping. just purchased the wood for my Warre hive today. will be blogging about constructing the hive based on your plans. am flanked with a pantheon of master carpenters and boat builders for neighbors in my neck of Maine. but expect, given the clarity of your design plans to be able to build my hive without forking over any compensatory cases of beer to my neighbors. You CAN build your own backyard Warre garden beehive! If you can follow simple step by step instructions... you really can do it! If you can understand simple black and white diagrams... you really can do it! If you can measure and cut a board and hammer a nail... you really can do it! PDF Manual: 56 pages of no-fluff, step by step, how-to content. Frame Plans: How to build your own frames for the Garden Hive. Parts Checklists: Complete parts checklists for both 1" and 5/4" wood thicknesses. Hive Diagrams: Complete plans for both 1" and 5/4" wood thicknesses. 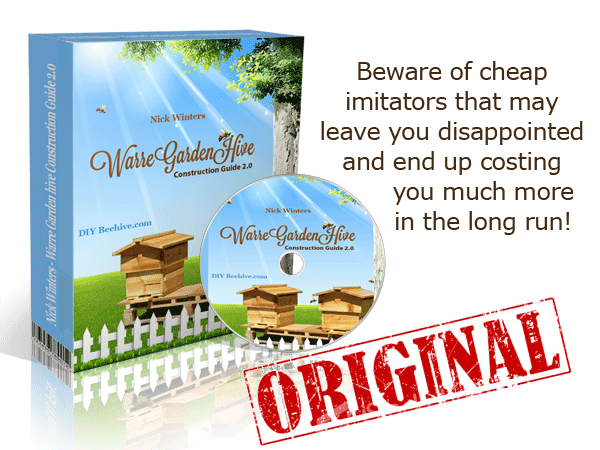 Training Videos: Step by step instructions explaining the Garden Hive Construction Guide in detail. Bonus Report, Hotsheet and Checklists: Tool lists, building tips, beekeeping resources and plans for complementary hive parts. Bonus Natural Beekeeping Webinar and MindMap: 2 hours of beekeeping content with live Q&A session...plus the original mindmap in three different formats. 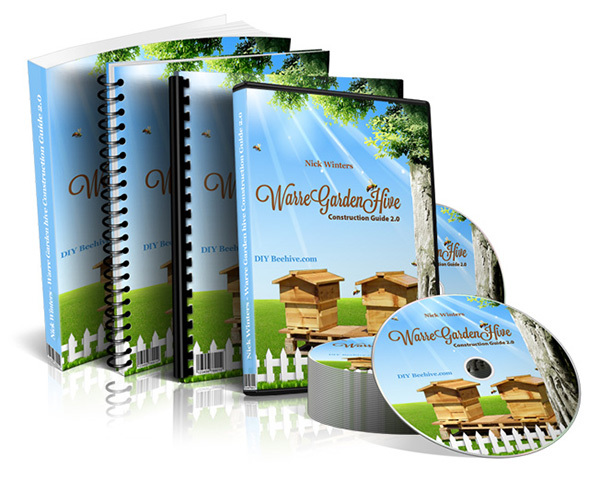 iPad Ready Content All components of the Warre Garden Hive Construction Guide 2.0 are 100% iPad compatible! Try out the Warre Garden Hive Construction Guide 2.0 for a full 2 months. If you are not satisfied with it in any way within those 60 days, just let me know. I'll send you a complete refund from my own money, no questions asked. I am starting to build a new hive now for next spring. I may even build two of these. The plans were simple and easy to read and they made making the hive very easy. I like the step-by-step photos. In one weekend (with some interruptions) I was able to make a hive with two boxes. Now all I need is the bees! Thank you so much for the copy of the construction guide, you have done a first class job the photographs and descriptions made the roof construction a piece of cake. I have just completed my first one and it looks fine, I am now waiting for my first swarm to take up residence. Your photographs and detailed explanations cover all the angles and make the building of the hive an enjoyable and stress free experience, I am unable to find anything to criticize. Please feel free to use any of my observations, I am only to happy to help promote this most useful publication and further the cause of the Warre system of beekeeping. My husband and I are just starting beekeeping. We had done some research and built a horizontal top bar hive. This took several days and turned out fine but the plans were a little difficult to follow. Then I came across your plans for the Warre Hive and decided to try this. Yesterday afternoon we put together 5 hive boxes and will complete the roof and base today. The plans are great, clear, and concise. The pictures are wonderful. We used cedar and will leave it natural. Tomorrow we will introduce a package of bees in each hive. We are excited and look forward to starting. Your plans, pictures and web site were so very helpful and helped to fuel our excitement. We will continue to follow your website as we go. We hope to see plans for a feeder for the bees. Thanks so much.